How much text do you have to accompany your videos? There is a school of thought that you need lots of text together with a video. The notion is that unless people can get an idea of what the video is about, they are unlikely to watch it. Furthermore, you get all those “SEO experts” telling you that Google needs lots of text to rank your pages, so if you don’t write 1,000 words to go with your two-minute video, the content will be virtually invisible. Tell that to the multimillion dollar “YouTubers” who only publish video content with no text….! The real conundrum for content marketers is whether they are wasting time by writing the accompanying text. New research implies they are. Text and video do not work well together, it seems. The study from Taiwan compared the engagement of people with a recipe page for which specific skills needed to be learned. Those skills were described in writing, but were also shown in a video. The researchers looked at eye tracking results and also tested people’s ability to retain the relevant information, depending on which kind of page they looked at. Some people were given a static page with just text and a picture. Others had text and a video. The results were fascinating. People who were given the recipe and a description of the relevant skills on a text-based page, with just a picture, were better able to retain the information compared with people who had a video and text to look at. It seems that people who had text and a picture glanced at the picture and then concentrated on the text. However, when there was a video present people tended to flick between the two, suggesting that they didn’t take in enough information to retain it. So if you want people to remember your content in a video, don’t include a lot of text – it confuses people. It turns out that if people had previous knowledge which helped them understand the recipe videos in the study, then they were better at retaining the new information if all they looked at was the text. But for students with low prior interest, the video alone appears to have helped retention of information best. 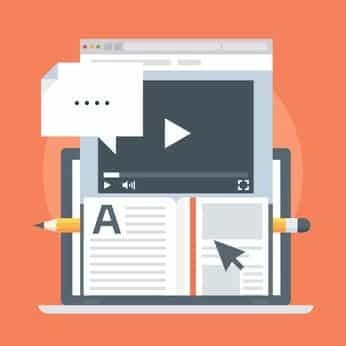 So, if you know that your audience is new to the information you have in your video, publishing it alone without accompanying text helps them most. The study also showed that when a video was present it got much more attention than the text. In other words, when your page has a video on it, there is much less reading of the text anyway. So what is the text there for? If people are not looking at it, why are you writing it? What this study suggests is that if you have video you are better off publishing it without much, if any accompanying text. Text will confuse people as they flick between reading it and trying to watch the video. Ultimately, though, what this study implies is that content should EITHER be text OR video, but not both together. Remember too that the study shows that there is a high retention of material that is just text. Maybe you don’t even need to produce those videos after all..!